In the hierarchy of genres taught in art history class, desert landscapes would be low on the list. But they positively rule compared to the lowly still life. Fortunately, the lowest-rated form has a new champion in Eric Merrell. 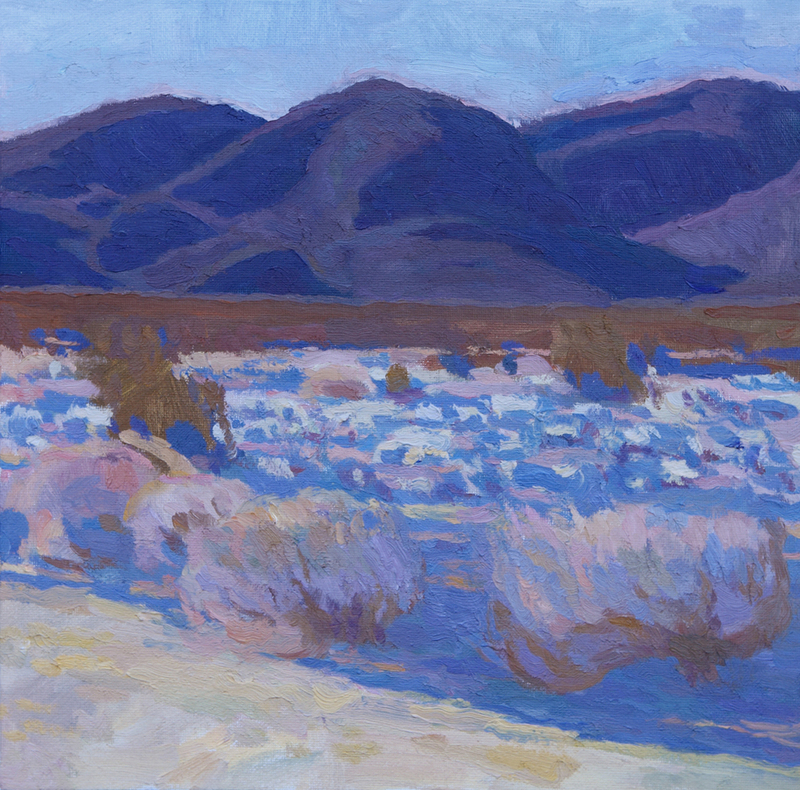 The Pasadena artist has a style and intensity that attracts followers for whatever he’s doing, whether it’s painting Joshua Trees at midnight or a potted Euphorbia in his own backyard. Golden Needles, 30" x 30"
The Coors Western Art Exhibit is an exciting way to start off the new year and I'm psyched about the four pieces I'll be showing. They work well as a group, but individually each has its own mood. If you're in Denver I hope you'll take some time to visit the exhibition - it runs along with the National Western Stock Show from January 7-22, 2017. More about my work in the exhibit here. Arriving Quietness, 24" x 26"
In the Gloaming, 24" x 18"
Walls Become Paths, 24" x 18"
Eric Merrell, Saguaro Forest, 2016, 16" x 16"
I'm thrilled to have been invited to participate in an exhibition at the National Cowboy & Western Heritage Museum in Oklahoma City. 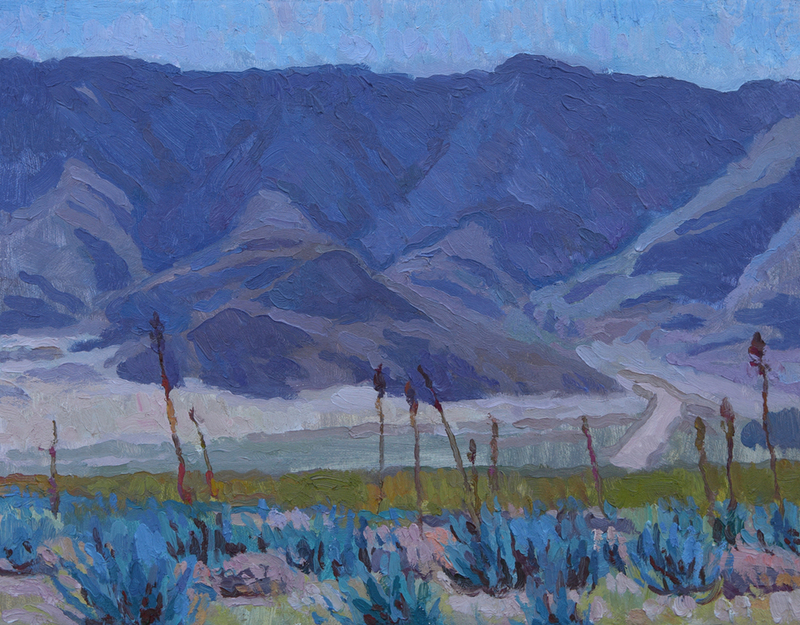 These two new pieces are from Tucson, AZ and the San Gabriel National Monument just north of Los Angeles. Small Works Great Wonders will be on view November 11 – December 31, 2016. Eric Merrell, American Landscape, 2016, 11" x 20"
I also make my own frames. Top: matte black; Bottom: 12K white gold. Eric Merrell, The Moon Stirred, 2016, 20" x 20"
I'll be exhibiting three paintings at La Casita del Arroyo in Pasadena on October 9, 2016. The Moon Stirred is a nocturne, far up the Upper Arroyo Seco back in the San Gabriel Mountains, the full moon rising over a silhouetted cliff and the flower stalks of Yucca whipplei, the archetypal yucca of The San Gabriels. The Lower Arroyo is seen in both Arroyo Dusk and Arroyo Seco Afternoon. The San Marino Tribune was kind enough to use my nocturne for their article announcing the exhibit. 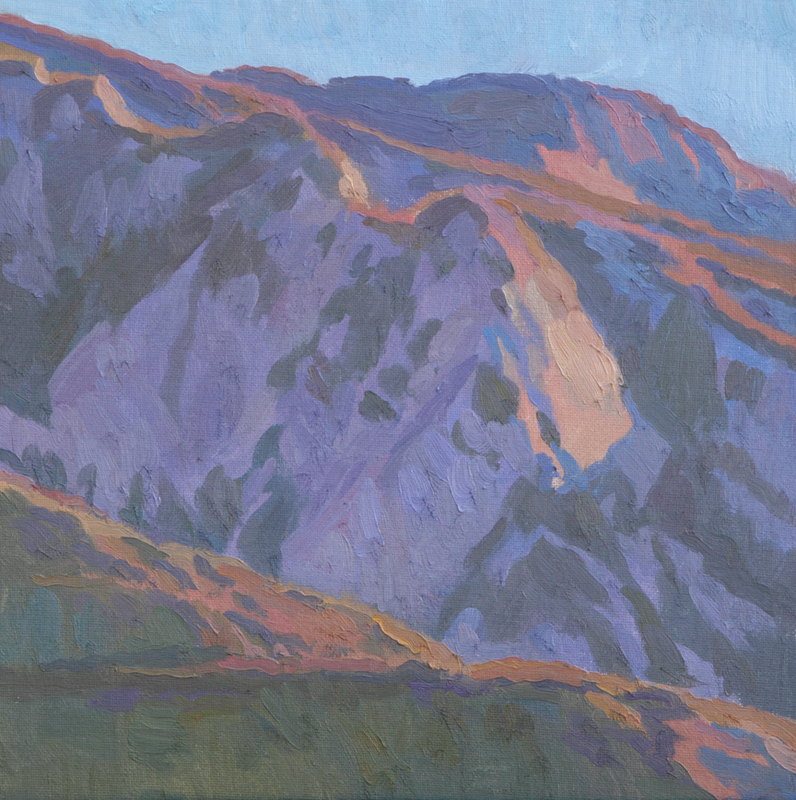 Eric Merrell, Arroyo Dusk, 2016, 20" x 20"
Eric Merrell, Arroyo Seco Afternoon, 2011, 12" x 16"
Eric Merrell, Towards the Flame, 2015, 24" x 48"
I recently juried an exhibition for SCAPE, a group of landscape painters based in the Santa Barbara-Santa Ynez area. These two paintings of mine are included in the exhibition, which is currently on view at the Wildling Museum in Solvang from October 8-23, 2016. 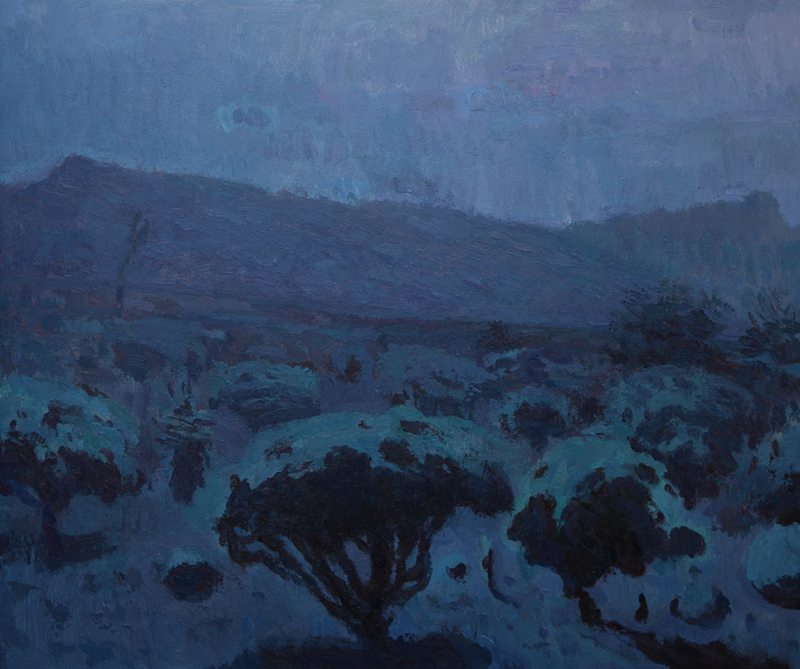 Eric Merrell, Desert Moonlight with Jupiter Setting, 2013, 24" x 26"
Desert Shores, 2016, 40" x 40"
If you're in southern California, I'm going to have three paintings featured at the upcoming season finale of Classical Underground next Monday, June 6. CU is an informal concert series featuring many extremely talented musicians playing classical pieces that aren't heard often. It will be really exciting to see the paintings in a live music setting. This exciting project was just released a few weeks ago. Nocturnes is a short film that follows me into the desert while I paint at night. It was shot on a Sony A7S, which is the first camera with the ability to film in moonlight without any other light sources. It was all shot on location - even the lightning storm. 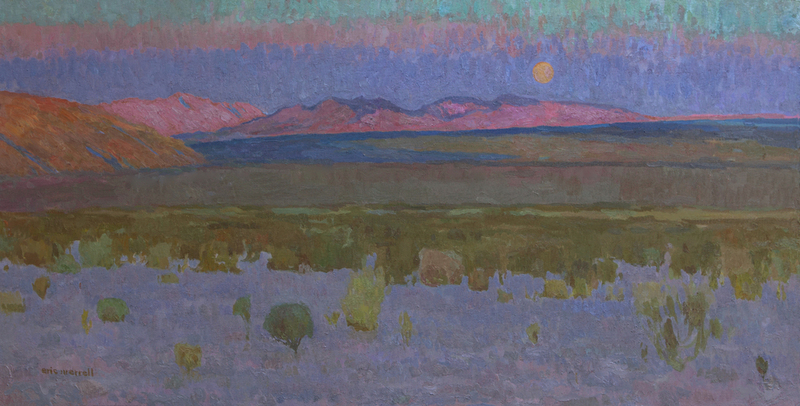 Henry Hensche (1899-1992), a painter known for his connection to Provincetown, MA, was also a highly influential teacher and a major proponent of the role of color in painting. (His west coast counterparts of the mid-20th century were Sergei Bongart and Theodore Lukits.) Hensche was a student of Charles Webster Hawthorne, who was in turn a student of William Merritt Chase; Chase's outdoor painting school on Shinnecock, Long Island was one of the earliest to be influenced by the lessons of the French Impressionists. 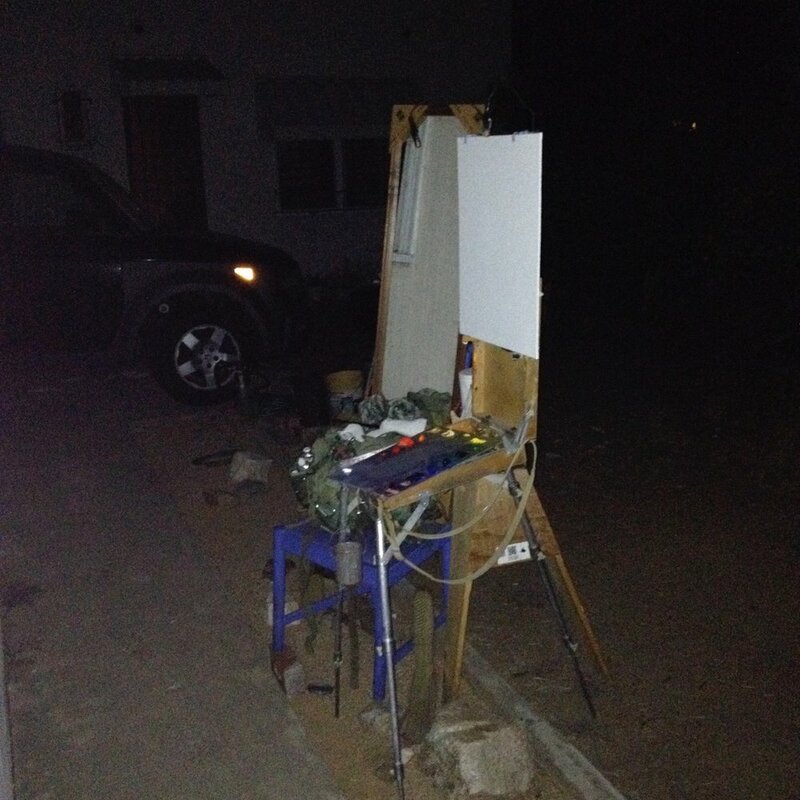 The setup used for painting my Self-Portrait in Moonlight. Mirror sitting on a chair to the left of my easel. I used a full color palette. Self-portrait in progress. Color is greatly reduced at night, but we can still see some things. Two small LED lights provide enough light to see my painting and the color on the palette. Looking for big shapes and color differences at this stage. Moonlight has fascinated the arts for centuries. Writers have composed about its romance, artists have painted its mystery, musicians and composers have been moved to produce beautiful passages that evoke those ideas. But while moonlight has been depicted by many painters, it was often done from memory out of necessity, because it's hard to see and paint in the dark. 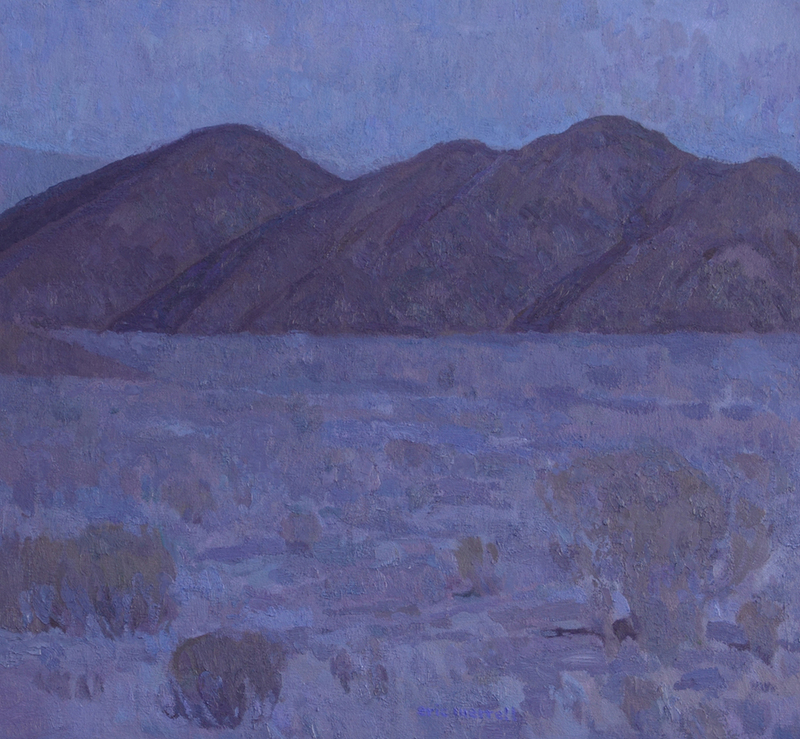 Despite the difficulties involved, artists are in good company: Van Gogh, Caspar David Friedrich, Frank Tenney Johnson, Elihu Vedder, Frederic Remington, and Lockwood de Forest are just a few who painted nocturnes. Some painted by candlelight, some tried working in the near dark after memorizing the colors on their palettes; some painted from memory or imagination, while other artists painted an imagined nocturne on location - in the middle of the day. I'm fascinated by all of these depictions, but the thing that always rang a little off for me was that many of these moonlit scenes felt too 'crisp', too similar to daylight - they didn't feel like moonlight. When I'm standing in moonlight, especially with no ambient light, it's very easy to navigate and walk around - individual trees and plants are distinguishable - but details, sharp edges, and the full spectrum of daylight color are greatly reduced. We're left with softness, unidentifiable forms blurring into other forms, edges that get lost and blur into the sky, and a very reduced (though not at all achromatic) color range. Many nocturnes painted today employ too much value contrast - the lightest lights often look like spotlights on canyon walls or trees, not soft moonlight. (Urban settings are obviously going to be different.) Interestingly, nocturnes are often not landscapes shrouded in absolute darkness painted with the darkest pigments; even a quarter moon has light enough to see some things. Instead they're a little lighter, maybe in the range of 80% dark; but the lighter values are only slightly lighter. Technology has helped advance nocturne painting. While artists working in previous centuries were extremely limited in how they could approach painting at night, today we have many different portable lighting options that make it possible to stand outdoors in moonlight and paint what we see. Despite this, painting moonlight on location is still considered something of an impossibility. Of course it isn't easy, but neither is painting during the day. How many tries did it take to come up with something you thought was successful when you started painting? It takes time and preparation to learn the approach. Still, the challenge of painting nocturnes is the same as during the day: to paint what you see, not what you think you see. What we see at night is much different than what we see during the day, but since humans are (for the most part) diurnal, we tend to think of things in terms of daylight. Moonlight can often border on abstraction, but that's appealing to me. Everything can't be explained. Don't worry about the science behind it. A nocturne shouldn't be painted in the same way as something painted during the day. With landscape, it's fairly easy to allow ourselves to abstract. I often paint landscapes in moonlight. My self-imposed challenge with these two portraits painted on location in the moonlight was two-fold: looking at how the color differed between the two paintings (the first was painted a few days before the full moon in July, the second a month later in August), as well as painting what I could truly see; allowing myself to lose features or elements of likeness if I couldn't actually see it. In the self-portrait, the eyes and eye sockets lost most of their detail, so I just tried to paint them as they appeared. In the other one, I could make out cool bluish glints of moonlight reflecting in her eyes, but the shadow on her neck nearly got lost in her hair. Stand in the dark awhile, let your eyes adjust. You'll be amazed at what you can see, and paint. 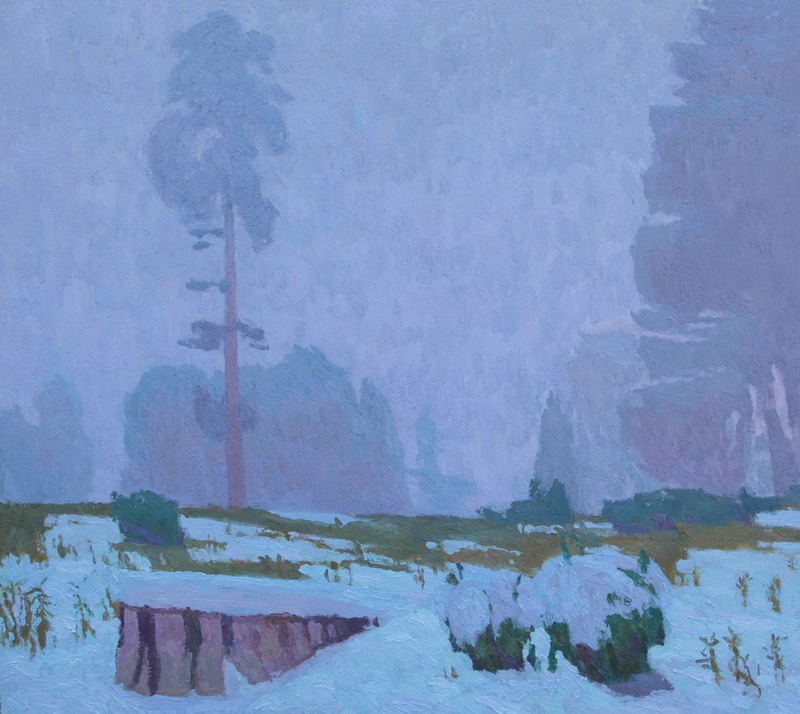 If you want to explore nocturnes further, join me for my annual Nocturne Painting Workshop, October 24-25, 2015. This excerpt in Art and Artists from July 14, 1907, Antony Anderson's weekly art column in the L.A. Times caught my eye. Interesting read. "Can Color Be Taught?" "The colorist is simply a man in whom a certain set of nerves are unusually sensitive, but those nerves by training can be made still more sensitive, and can be brought more completely under the control of his intelligence. While he remains untaught he is unable to use his powers effectively, because he does not understand them. His successes will be accidental, his methods will be erratic, and the results at which he arrives will be disconnected and probably unconvincing. Subjected to discipline, however, he will become more consistent, and he will find out exactly what he should do in order to convey to others the impression that exists in his mind." "The man who would teach color must himself be a colorist exquisitely sensitive and perfectly trained; he must be able to dissect and analyze the most subtle combinations, and to explain the details of the most elusive harmonies, for of all sciences the one with which he has to deal is the least susceptible of being governed by hard and fast rules." "To arrange color by rule is to make it lifeless and without meaning, to destroy its power of exciting emotion, and to reduce it to a mechanical balancing of color areas. What I understand by the science of color is the accounting for the relation between the pitch and area of the colors used in a properly adjusted combination, and the explanation of the manner in which varying color tones can be brought into agreement so that the result of their juxtaposition is absolutely harmonious. That this science is subject to laws which call for complete obedience I admit, but these laws must be taught by demonstration, not by text-books. And can you tell me of any school in which teaching of this kind is available?" (reproduced from The Lay Figure, in International Studio). I'll be teaching two workshops next month in which we'll focus on color and discuss a lot of these points. How do you make good color without subjecting it to formulas? Color has always been considered part of emotion, hard to control; the opposite is found in the reserve and control in academic drawing - the classic battle of the Florentines v. the Venetians, of line v. color. Color is extremely personal, but it can be used to communicate as well. I grew up in Northern California where summer turns the rolling hills to a burnished gold. 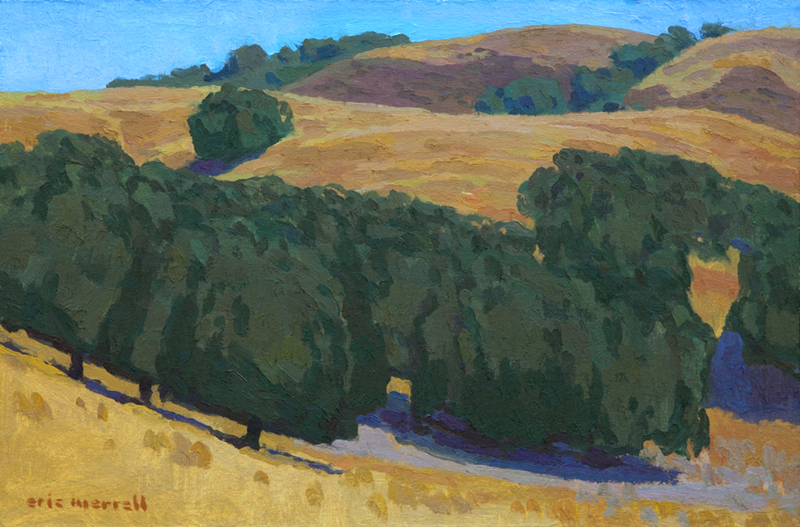 With the oaks and sage mingling and creating hillside patterns, it's the classic California landscape. I was recently was able to explore and paint my hometown - here are a few of the pieces done on location. It was definitely hot out - my thermometer read 100F in the shade - but my goal wasn't bragging rights for painting in extreme temperatures; I wanted to use color to convey that heat. The darker and warmer reds in the shadow on my face are (relatively) darker compared to the greenish-oranges in the shadow on my neck, and the cooler pinks and violets around my cheekbones are lighter than those reds; still, while more 'colorful' than one might expect, when taken all together they should hold a sense of form and create a sense of light. This kind of information is lost in a photograph, hence the necessity of painting in the heat. A little side note about my color: I've had people ask how I categorize myself: would I consider myself an Impressionist, Expressionist, or lately, Fauvist (what, no Romanticism?). While I admire artists from those movements, I don't feel akin to them. And while the Fauves can be fun, they were essentially rejecting three-dimensional space, so when Andre Derain painted a beach he used an intense red, possibly straight out of the tube. My color is not the broken color of the Impressionists nor the 'liberated' color of the Fauvists: I'm interested in searching for subjective/personal color relationships that still function within our shared experience of humanity, so although certain colors might come as an unexpected surprise to a viewer, they make sense and (hopefully) lead to new insights. My setup: with a mirror just to the left of the easel, I had two umbrellas and a black fabric to help control reflected light. * When looking at paintings our natural tendency is to want people to look 'right' - getting a likeness - this makes the human figure a difficult subject to use for studying color. Not the premeditated academic 'color' like Ingres or Cabanel, but beautiful natural light that is as much a joy for the artist to discover as it is for the viewer. My focus has been in studying how light works and how we perceive it; landscape and still life allow more freedom to experiment in those areas.